Don Quixote (Chinese: 魔俠傳之唐吉可德; pinyin: Móxiáchuán zhī Tángjíkědé) is a 2010 Chinese and Hong Kong film directed by Ah Gan based on Miguel de Cervantes' 17th-century novel. It was promoted as China's first fully 3-D film. Director Ah Gan stated that nearly 60 percent of the film is made up of special effects. To create these special effect shots, he tried several special effects companies before taking his film to England, where he used the equipment and technology from the hit film Ice Age. The film was promoted as China's first wholly 3-D movie as only the action sequences in Yuen Woo-ping's True Legend (2010) were shot in 3-D.
Don Quixote was released on October 15, 2010 in China. In its opening week, the film grossed a total of $1,809,682 and was the third highest film in the Chinese box office. The film grossed a total of $5,115,844 in China. The film was released on October 28 in Hong Kong where it grossed a total of $16,246. Film Business Asia gave the film a five out of ten rating, calling it a stating that "after about half-an-hour — around the time the film leaves behind the novel and embarks on its own invented story — it becomes clear that it isn't developing any dramatic momentum of its own." China, Tang dynasty. Tang Fanghai (Guo Tao) is the bane of his parents, an adult dreamer who lives in a world of martial arts novels and their knight-errant heroes. One day he decides to leave home and become a knight-errant himself, calling himself Tang Jihede (Don Quixote), donning armour, christening his horse with a fancy name, and making a local village girl, Cuihua (Karena Lam), into his idealised paramour, Princess Fragrance. 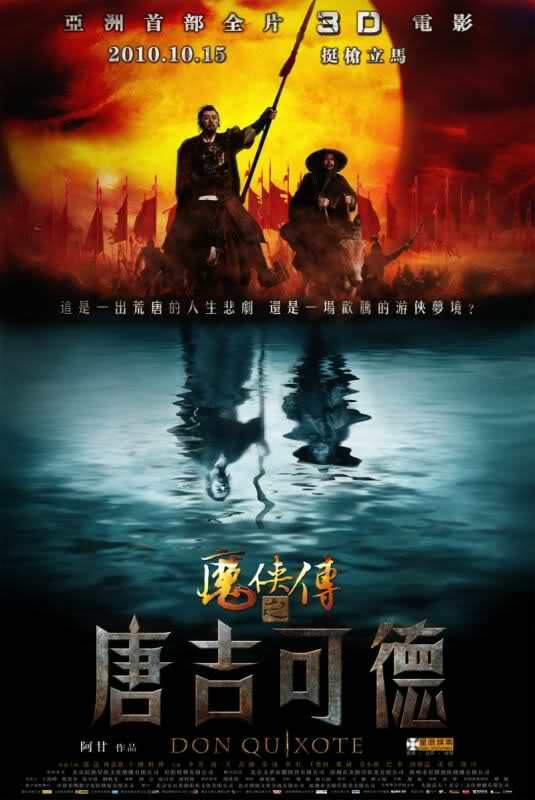 After paying an old beggar on a mountain top (Ba Duo) to beat him and "unblock" his magic powers, Tang jousts with the villainous Linghu (Liu Hua), whose sect leader, Godfather (Wang Shuangbao), wants to make off with Cuihua. Tang is unable to prevent Cuihua's abduction but recruits fellow villager Sang Qiu (Wang Gang) as his sidekick with the promise of making him governor of an island. On the way to the capital, Chang'an, he imagines a windmill is a dust-devil that is about to overwhelm an army, and "defeats" it. And at an inn, he fights and defeats another of Godfather's followers, the epicene Ximen (Hai Yi Tian). By the time he reaches the capital, he has become famous as a heroic knight-errant, and goes to face Linghu, Ximen and fellow tyrant Dongfang (Paul Chun) at their sect's headquarters, where Cuihua is being held for Godfather's pleasure. Describing itself as "Asia's first wholly 3-D movie" — only the action sequences inYUEN Woo-ping 袁和平's True Legend 蘇乞兒 (2009) were in that process — Mainland comic director Ah Gan 阿甘 (aka Kiefer Liu) aims very high with this big-budget Chinese version of Miguel de Cervantes' 17th-century classic novel but only occasionally hits the target. On paper, the Spanish original seems ripe for adaptation as a wuxia movie, as the mediaeval knights' code is not a million miles from that of Chinese swordplay fiction, and Don Quixote 魔俠傳之唐吉可德 (2010) starts off quite faithfully, with popular Mainland comic actor GUO Tao 郭濤 (an Ah Gan regular) managing to blend the two cultures into an entertaining figure with his likable combination of chivalrous innocence and complete stupidity. However, after about half-an-hour — around the time the film leaves behind the novel and embarks on its own invented story — it becomes clear that it isn't developing any dramatic momentum of its own. It isn't just a matter of Guo Tao's character remaining one-dimensional and accruing no pathos. Beyond its good visual effects — apart from the dust-devil, largely focused on mistily mythic mountain peaks for 3-D purposes — the film is directed more like a TV drama series than a big-screen adventure, with lots of studio sets (even for exterior shots) and dialogue sequences. The repartee between Guo's knight-errant and WANG Gang 王剛's Sancho Panza-like sidekick is good; but after a while veteran Wang, a popular TV drama actor and presenter (hosting Beijing TV's popular antiques quiz show World Collection 天下收藏), gradually becomes the most interesting character in the movie, especially in his dialogue with other actors like LI Jing 李菁's oily lackey. Good actresses like Hong Kong's Karena LAM 林嘉欣 — stuck in a screamy role as the abducted "princess" — and China's MIAO Pu 苗圃 are wasted. When Ah Gan is on form (as with Two Stupid Eggs 兩個傻瓜的荒唐事 (2007)), his style of ridiculous comedy can be both funny and inventive. Here, he seems overwhelmed by the scale of the production and its technical demands, as well as (on the scriptwriting side) the challenge of making his Chinese Don Quixote more than just a lightly comic cut-out. On the production side, the movie looks reasonably well-appointed but not lavish, and its rich symphonic score by ZHAO Zhao 趙兆 is consistently more expressive than the movie itself.